We need to book a flight to Turkey, stat! Aside from being stylishly cool, the It girls (and their It boyfriends) all share the love for traveling. If you need proof, simply stalk their IG feeds to see a series of random weekend getaways and out-of-the-country adventures—OOTDs, barkada shots, and cheesy couple pics included. Speaking of which, we couldn’t help but notice their recent posts featuring beyond-amazing photographs we would so love to see in real life—the Hot Air Balloons at Goreme, Cappadocia, Turkey. and Martine Cajucom, who also visited Turkey! Cappadocia is a region in Turkey known for its spectacular natural sites. The vast Cappadocian landscape—which you can better appreciate via a swanky hot air balloon ride that incudes a bottle of vino—is dotted with rock houses, volcanic rock formations called chimney fairies (cute! ), vineyards, and even a peek of the black sea up north. The best part? 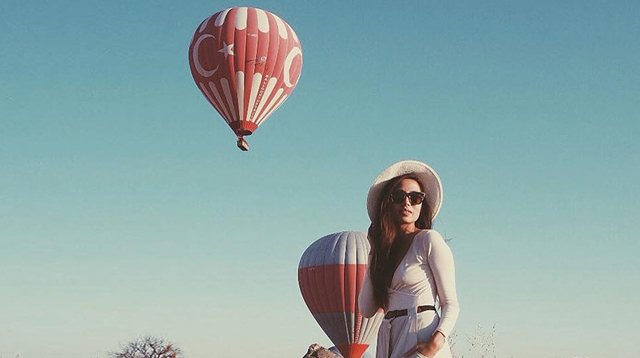 Unlike the annual Hot Air Balloon Festival in Clark, Pampanga, the balloons fly year-round in Cappadocia! The balloon ride takes approximately an hour, and if you want the best possible photo to post on IG, we suggest you book the first flight in the morning to catch the sunrise. The best time to go, with less chances of your flight being cancelled due to unruly weather, would be anytime around April through October. During these months, as much as 40 to 100 balloons are up in the sky! Imagine the view in this one-of-a-kind aeronautical adventure. Sigh. Finally, if you’re scared of heights and would rather just enjoy the sight, you can also opt for a hike with a detour to the underground cities, a bike tour, or even an equestrian tour. Or, you know, just sit there, relish the view and take an OOTD or two. Now, we wonder where these It girls will take us next.